American test pilot mission specialist astronaut 1985-1995. Status: Inactive; Active 1985-1995. Born: 1945-05-19. Spaceflights: 3 . Total time in space: 27.29 days. Birth Place: Groton, Connecticut. Thuot was nicknamed Pepe, for his wimpy French-sounding name. He was also called a '24 V person in a 12 V world" due to his hyperactivity and constant nervous repartee prior to launch. PERSONAL DATA: Born May 19, 1955, in Groton, Connecticut, but considers Fairfax, Virginia, and New Bedford, Massachusetts, to be his hometowns. Married to the former Cheryl Ann Mattingly of Leonardtown, Maryland. They have two children. He enjoys golf, running, music, and family activities. His parents, Capt. & Mrs. Clifford G. Thuot, Sr., (USNR, Ret. ), reside in Fairfax, Virginia. Her parents, Mr. & Mrs. Robert L. Mattingly, reside in Leonardtown, Maryland. EDUCATION: Graduated from Fairfax High School, Fairfax, Virginia, in 1973; received a bachelor of science degree in physics from the U.S. Naval Academy in 1977, and a master of science degree in systems management from the University of Southern California in 1985. ORGANIZATIONS: Member of the U.S. Naval Academy Alumni Association, the Association of Naval Aviation, the University of Southern California Alumni Association, the Association of Space Explorers-USA, the American Astronautical Society, and an Associate Fellow of the American Institute of Aeronautics and Astronautics. SPECIAL HONORS: Two Defense Superior Service Medals, three NASA Space Flight Medals, two NASA Exceptional Service Medals the National Intelligence Medal of Achievement, the American Astronautical Society Flight Achievement and Victor A. Prather Awards for 1993, the National Defense Service Medal, two Navy Meritorious Unit Commendations, two Navy Battle Efficiency Awards, the Sea Service Deployment Ribbon, and seven NASA Group Achievement Awards. EXPERIENCE: Thuot graduated 30th in his class from the U.S. Naval Academy in 1977 and commenced Naval Flight Officer training in July 1977. He received his wings in August 1978 and then reported to Fighter Squadron 101 at NAS Oceana, Virginia Beach, Virginia, for initial F-14 Tomcat training as a Radar Intercept Officer (RIO). Upon completion of this training he was assigned to Fighter Squadron 14 and made overseas deployments to the Mediterranean and Caribbean Seas aboard the USS John F. Kennedy and USS Independence. While assigned to Fighter Squadron 14 he attended the Navy Fighter Weapons School (TOPGUN). He was then selected to attend the U.S. Naval Test Pilot School in May 1982. Upon graduation in June 1983 he worked as a project test flight officer at the Naval Air Test Center flying the F-14A Tomcat, A-6E Intruder and the F-4J Phantom II until June 1984 when he returned to the U.S. Naval Test Pilot School as a flight instructor. He has over 3,500 flight hours in more than 40 different aircraft, and has over 270 carrier landings. NASA EXPERIENCE: Selected as an astronaut by NASA in June 1985, Thuot has served in a variety of technical assignments. As the Remote Manipulator System (robot arm), crew equipment, and Extravehicular Activity (EVA) representative for the Astronaut Office, he participated in the design, development, and evaluation of Space Shuttle payloads, crew equipment, and crew procedures. He performed Space Shuttle flight software verification in the Shuttle Avionics Integration Laboratory and served as a CAPCOM in the Mission Control Center, responsible for communications with the crew for numerous Space Shuttle missions. He served as the lead astronaut for Space Station integrated assembly and maintenance operations within the Astronaut Office. He served as Chief of the Astronaut Office Mission Support Branch, as well as supervising Astronaut Candidate training for the Class of 1995. A veteran of three space flights, STS-36 in 1990, STS-49 in 1992, and STS-62 in 1994, Thuot has logged over 654 hours in space, including 17.7 hours on three space walks. On his first flight, Thuot was a mission specialist on the crew of STS-36 which launched from the Kennedy Space Center, Florida, on February 28, 1990, aboard the Space Shuttle Atlantis. This mission carried Department of Defense payloads and a number of secondary payloads. Following 72 orbits of the Earth in 106 hours, the STS-36 mission concluded with a lakebed landing at Edwards Air Force Base, California, on March 4, 1990, after traveling 1.87 million miles. Thuot was a mission specialist on the crew of STS-49, the maiden voyage of the Space Shuttle Endeavour, which launched from the Kennedy Space Center on May 7, 1992. During that mission, Thuot, along with astronaut Rick Hieb, performed three space walks which resulted in the capture and repair of the stranded Intelsat VI F3 communications satellite. The third space walk, which also included astronaut Tom Akers, was the first ever three-person space walk. This 8 hour and 29 minute space walk, the longest in history, broke a twenty year old record that was held by Apollo 17 astronauts. The mission concluded on May 16, 1992 with a landing at Edwards Air Force Base after orbiting the Earth 141 times in 213 hours and traveling 3.7 million miles. On March 4, 1994, Thuot launched aboard Columbia on STS-62, a microgravity science and technology demonstration mission which carried the United States Microgravity Payload (USMP-2) and the Office of Aeronautics and Space Technology (OAST-2) payloads. More than sixty experiments or investigations were conducted in many scientific and engineering disciplines including materials science, human physiology, biotechnology, protein crystal growth, robotics, structural dynamics, atmospheric ozone monitoring, and spacecraft glow. During the spacecraft glow investigation, Columbia's orbital altitude was lowered to 105 nautical miles, the lowest ever flown by a Space Shuttle. STS-62, one of the longest Space Shuttle missions, concluded on March 18, 1994 with a landing at the Kennedy Space Center after orbiting the Earth 224 times in 13 days, 23 hours, and 16 minutes and traveling 5.8 million miles. With the completion of his third mission, Thuot has logged over 654 hours in space, including over 17.7 hours on three space walks. Thuot left NASA in June 1995, and returned to the Navy. He is an Associate Chairman in the Aerospace Engineering Department, United States Naval Academy, Annapolis, Maryland. Born May 19, 1955, in Groton, Connecticut, but considers Fairfax, Virginia, and New Bedford, Massachusetts, to be his hometowns. Married to the former Cheryl Ann Mattingly of Leonardtown, Maryland. They have two children. He enjoys golf, running, music, and family activities. His parents, Capt. & Mrs. Clifford G. Thuot, Sr., (USNR, Ret. ), reside in Fairfax, Virginia. Her parents, Mr. & Mrs. Robert L. Mattingly, reside in Leonardtown, Maryland. Graduated from Fairfax High School, Fairfax, Virginia, in 1973; received a bachelor of science degree in physics from the U.S. Naval Academy in 1977, and a master of science degree in systems management from the University of Southern California in 1985. Member of the U.S. Naval Academy Alumni Association, the Association of Naval Aviation, the University of Southern California Alumni Association, the Association of Space Explorers-USA, the American Astronautical Society, and an Associate Fellow of the American Institute of Aeronautics and Astronautics. Two Defense Superior Service Medals, three NASA Space Flight Medals, two NASA Exceptional Service Medals the National Intelligence Medal of Achievement, the American Astronautical Society Flight Achievement and Victor A. Prather Awards for 1993, the National Defense Service Medal, two Navy Meritorious Unit Commendations, two Navy Battle Efficiency Awards, the Sea Service Deployment Ribbon, and seven NASA Group Achievement Awards. Thuot graduated 30th in his class from the U.S. Naval Academy in 1977 and commenced Naval Flight Officer training in July 1977. He received his wings in August 1978 and then reported to Fighter Squadron 101 at NAS Oceana, Virginia Beach, Virginia, for initial F-14 Tomcat training as a Radar Intercept Officer (RIO). Upon completion of this training he was assigned to Fighter Squadron 14 and made overseas deployments to the Mediterranean and Caribbean Seas aboard the USS John F. Kennedy and USS Independence. While assigned to Fighter Squadron 14 he attended the Navy Fighter Weapons School (TOPGUN). He was then selected to attend the U.S. Naval Test Pilot School in May 1982. Upon graduation in June 1983 he worked as a project test flight officer at the Naval Air Test Center flying the F-14A Tomcat, A-6E Intruder and the F-4J Phantom II until June 1984 when he returned to the U.S. Naval Test Pilot School as a flight instructor. Selected as an astronaut by NASA in June 1985, Thuot has served in a variety of technical assignments. As the Remote Manipulator System (robot arm), crew equipment, and Extravehicular Activity (EVA) representative for the Astronaut Office, he participated in the design, development, and evaluation of Space Shuttle payloads, crew equipment, and crew procedures. He performed Space Shuttle flight software verification in the Shuttle Avionics Integration Laboratory and served as a CAPCOM in the Mission Control Center, responsible for communications with the crew for numerous Space Shuttle missions. He served as the lead astronaut for Space Station integrated assembly and maintenance operations within the Astronaut Office. He served as Chief of the Astronaut Office Mission Support Branch, as well as supervising Astronaut Candidate training for the Class of 1995. A veteran of three space flights, STS-36 in 1990, STS-49 in 1992, and STS-62 in 1994, Thuot has logged over 654 hours in space, including 17.7 hours on three space walks. Departed: June 1995. Departed Date: 1995-06-01. Total EVA Time: 0.75 days. Number of EVAs: 3. Marital Status: Married. Children: two children. Childhood: Grew up in Fairfax, Virginia, and New Bedford, Massachusetts, son of a naval officer.. Education: Annapolis;Caltech;Patuxent. Family: Astronaut. Country: USA. Flights: STS-36, STS-49, STS-62. Projects: STS. Agency: USN. Bibliography: 12, 4457, 6108. 1945 May 19 - . Birth of Pierre Joseph Thuot - . Nation: USA. Related Persons: Thuot. 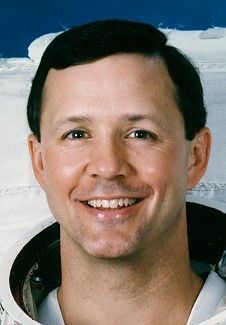 American test pilot mission specialist astronaut 1985-1995. 3 spaceflights, 27.3 days in space. Flew to orbit on STS-36 (1990), STS-49, STS-62..
1992 May 11 - . 20:40 GMT - . EVA STS-49-1 - . Crew: Hieb, Thuot. EVA Duration: 0.16 days. Nation: USA. Related Persons: Hieb, Thuot. Program: STS. Class: Manned. Type: Manned spaceplane. Flight: STS-49. Spacecraft Bus: Shuttle. Spacecraft: Endeavour. Attempted capture of Intelsat V1..
1992 May 12 - . 21:05 GMT - . EVA STS-49-2 - . Crew: Hieb, Thuot. EVA Duration: 0.23 days. Nation: USA. Related Persons: Hieb, Thuot. Program: STS. Class: Manned. Type: Manned spaceplane. Flight: STS-49. Spacecraft Bus: Shuttle. Spacecraft: Endeavour. Second attempted capture of Intelsat V1..
1992 May 14 - . 21:17 GMT - . EVA STS-49-3 - . Crew: Akers, Hieb, Thuot. EVA Duration: 0.35 days. Nation: USA. Related Persons: Akers, Hieb, Thuot. Program: STS. Class: Manned. Type: Manned spaceplane. Flight: STS-49. Spacecraft Bus: Shuttle. Spacecraft: Endeavour. Intelsat V1 finally captured in first three-person spacewalk..